Where Do You See Crocs in Puerto Vallarta? Summer season in Puerto Vallarta seems to bring out our local large reptiles. We attribute this to a typical phenomenon, in which the more populated an area with people, the less likely to spot wildlife. Not that crocs are shy; they do make appearances year-round. As we have said before, the rivers travel to the ocean; therefore crocodiles can make connections to most tributaries and swimming areas. It’s wise to know the facts and stay alert. Very few incidents have been reported in Puerto Vallarta over the decades, but each and every one gets a major amount of attention, even if it’s only a crocodile crossing the road or cruising between yachts in the marina. The common species seen in the Puerto Vallarta area is the American Crocodile. This particular groups’ milieu is wide and long, throughout Mexico; the lower coastal Pacific islands; Central America and the northern sections of South America. They can be found up to twenty miles inland in the states of Nayarit and Jalisco, where visitors to Puerto Vallarta might be inclined to roam. The male American crocodile has been measured up to nearly twenty feet. That’s a big croc and if you see one, do your best to allow him as much space as possible. Though crocodiles have no natural predators, other than humans, it’s wise to keep some kind of barrier between them and us. They are not known to be aggressive and attacks on people are quite rare but we leave it to others to test the theory. Oddly enough, reports over the decades of aggression towards humans have usually dealt with trespassers, turtle egg poachers and, quite often, other illegal activities. Crocodiles normally hunt at night and prefer limited moonlight but disruption of their normal habits, due to domestic interference, is not a great surprise. Given that, we are aware of instances in which off-leash dogs have been snapped up by crocodiles. When a dog approaches a crocodile, barking and snarling, the reptile is going to be prone to protect himself. Apparently dogs are a real delicacy for crocs, so it’s always a good idea to keep Fido leashed and in line. The American Crocodile is the only one of his species that thrives in both fresh and salt water, which seems to be the result of salt glands under their tongue. This is an unusual attribute, according to our cold-blooded research team. 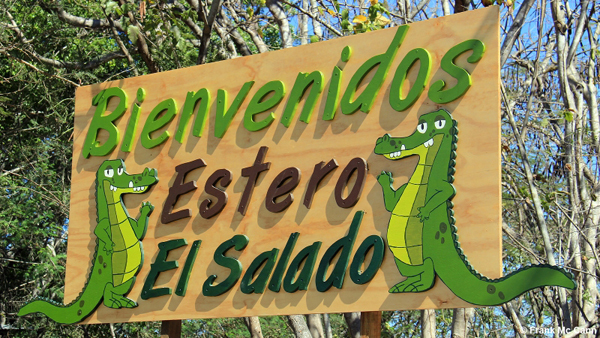 There are places to visit crocodiles in Puerto Vallarta, view them in their habitat and learn about their routines and behaviors. The University of Costa Preserve, close to the Flamingos Development and golf Course (where you see the huge golf ball from the highway); and Estero el Salado Sanctuary, north of Galeria Liverpool, which is across from the Cruise Ship Terminal. Bring your camera, wear sturdy shoes and a good amount of mosquito repellent.